Adjust your resistance with an adjustable, calibrated tension gauge that accommodates the youngest of beginners and the seasoned professional. Turn the adjustable knob counterclock-wise until it stops, but never force it past this position. Now, turn the knob clockwise until the desired resistance is reached. Your SideWinder can last any number of revolutions in either direction while maintaining the same resistance – just another way the Side-Winder stands apart from competitors. As you get stronger, the SideWinder gets stronger, so you must pace yourself accordingly. Start with minimum tension and work up slowly to greater resistance. A minimum of 20 to 75 repetitions for each position is recommended. PLEASE check with your physician prior to starting any new exercise regimen. The basic motion is a winding or squeeze-and-twist motion. You can twist with one hand or both. At the end of each workout, put your SideWinder in neutral by releasing the tension. 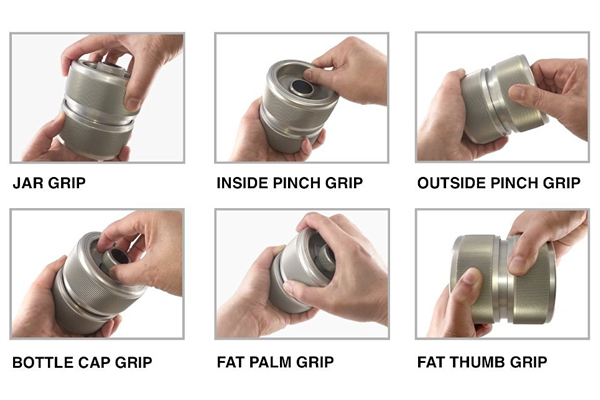 Grasp each handle firmly. 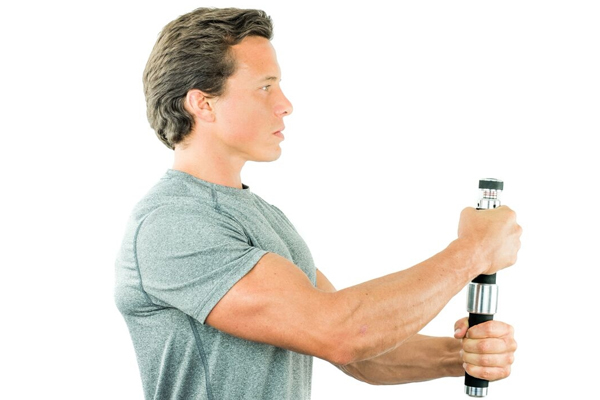 Extend arms straight out so the grips are horizontal. A simple winding, back and forth motion will increase strength from shoulders to fingers. 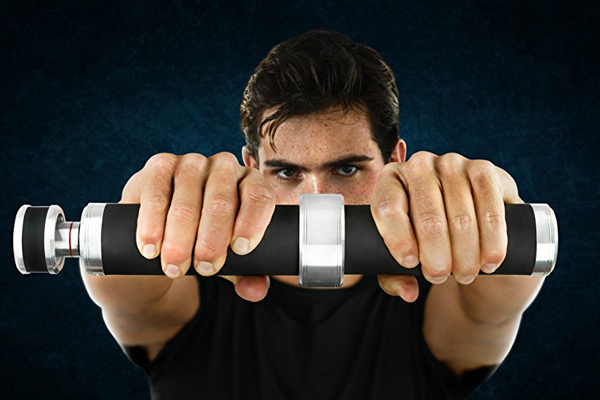 Holding the SideWinder® parallel to your chest will tone the sides of the wrist, hands, forearms, and biceps. Reverse grips after each set. Holding one end of the SideWinder® at a 45° angle, apply a twisting motion using downward pressure with the other hand. Alternate hands after each set using both clockwise and counterclockwise motions. Keeping the arms behind the back and as straight as possible, apply a winding motion. 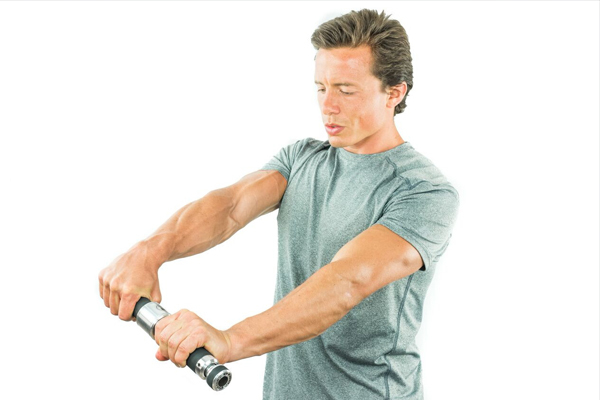 This exercise concentrates on the triceps and forearms. Adjustable tension from zero to impossible. Grip ready knurling on both handles and inside knurling on the left handle for special pinch exercise. Challenging muscle is the key to building muscle. Day 1: Use light resistance for 20 to 75 slow repetitions per exercise, with 5-15 second rest between each exercise – depending upon your condition – once or twice per day. Rest a day. Day 3: Repeat Day 1’s routine. Rest again. Day 5: Use heavy resistance for 10 – 20 slow repetitions per exercise, resting for 5 to 15 seconds in between. Again, this can be done once or twice a day. The next week, change up the order. This type of workout regime will prevent a plateau so you won’t be stuck at one level. Some of you may be able to handle this more than three days a week. It all depends on your recovery speed. Here’s another version of the Horizontal Grip exercise, and it’s pretty tough. Reverse positioning of your hands – one palm up and one palm down. Twisting your hand palm up toward you gives your forearm an extra work-out that you’ll really feel! Be creative with your workout – the more you change-up the routine and the more you keep your muscles guessing, the faster your muscles will develop and you’ll see greater results. A reminder . . . after each day’s exercise, turn your SideWinder’s resistance knob back to neutral, which is at no resistance. 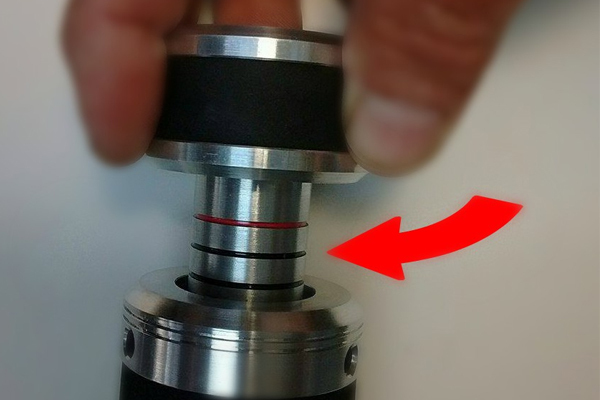 This will keep your ‘Winder in peak performance. You know . . . that your hand is the last link between you and your sport!